Is it time to get your child their first train set, or maybe upgrade their existing track? Wondering what the best train sets are? Toy trains aren’t simply designed to push and pull wagons — their primary purpose is to assist your child in skill building. Train sets can be entertainment for the entire family, creating long-lasting memories. They can also teach children to count, and enhance their creativity and problem-solving skills. For most of us parents, choosing the right train set might seem complicated. To facilitate your search, here’s some useful information, along with my selection of the best train sets for kids. Use the links above to check the latest prices or read our in-depth kids train set reviews below. Depending on the age of your child, there are some particular features to keep an eye on in order to appease them and also help them learn. Furthermore, as moms, we always have to keep safety, space, and more in mind. Let’s look at what’s important. Toddlers: Wooden trains are usually designed for toddlers. Heavier and more durable, they’re able to handle the skillful throws that toddlers can sometimes engage in (source). Some of the simplest train sets available are wooden, suitable for beginners. Young children: Battery-operated train sets are usually suited for children who have outgrown the basic versions. 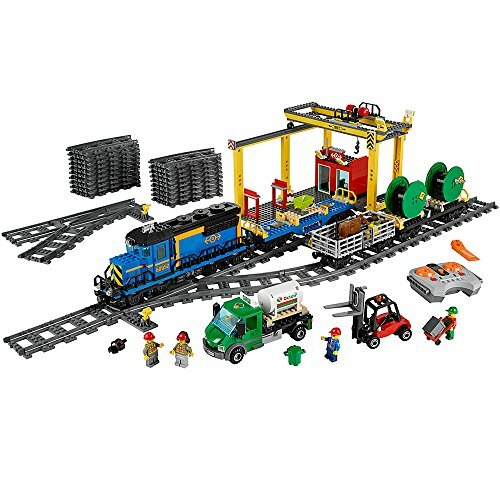 Typically made from plastic, these make an affordable and safe transition between wooden sets and a fancy electric train set. Older children, up to teens: Electric trains are great learning tools for older kids and a fun option for family bonding time. They will usually last for a lifetime if taken care of. The locomotives tend to be heavier and made out of metal, which could potentially injure younger children, if left unsupervised. Most kids go through cycles with their interests in cartoons, colors, and more. Receiving a train set is already an exciting experience on its own. So, when I bought my little girl a pink and purple train track with fairies, her face was simply priceless. Cartoon-themed train sets — such as Thomas & Friends — are popular as kids can create imaginative scripts and are familiar with the characters. You’ll also find other thematic choices, such as construction work, travel-focused, farmland, and more. Depending on your child’s interests, you may want to choose a train set according to what would spark their interest the most. How much space do you have at home to set up the train set? Will you need to dismantle it after every use, or do you have a permanent spot available? Some train sets can be set up vertically or horizontally, giving you the flexibility to match your available space. Other sets are already attached to a table, so you’d need to plan strategically. Finally, electronic trains are more challenging to assemble and put away. It would be preferable to create a dedicated location. Train sets can be as simple as circular tracks. For smaller kids, pushing their train around in a circle could be enough to hold their attention. As kids grow older, they might want something a bit more challenging, with track switching, bridges, and levels. The older your child is, the better he or she will be at handling a more demanding setup. Many tracks are also universal and therefore compatible from one brand to another. As your kid matures, this will give you the flexibility to choose additional tracks and accessories among different brands. When it comes to train sets, age might only be an indicator. Gifted kids may have fewer difficulties building things and concentrating on small constructions (source). When purchasing a train set, it’s important to take into consideration the maturity and potential of the child. Train sets are a classic staple in home entertainment for both kids and adults alike. With various features to choose from, there should be a little something for everyone to enjoy. Now that we’ve covered some of the things to consider, here is our selection for the best train sets for kids. Are you looking for a unique, personalized present? Combining learning and fun, this personalized “name train” might be a good option for kids aged three years and older. Each colorful letter is coated with safe, non-toxic paint. They attach to each other with a simple magnet, easy for any child to assemble and disassemble on their own. Made of sturdy maple hardwood, this versatile train is also compatible with other wooden train tracks. Does the name Percy sound familiar? If it does, it might be because it’s one of your kid’s favorite animated friends. This train set can hold up to 100 engines and, given all the accessories, boredom shouldn’t be an issue. This space-friendly train set can be configured in different layouts. 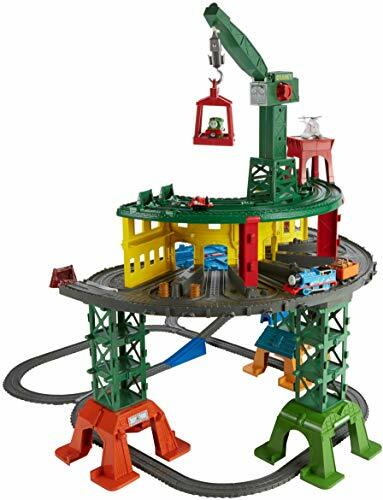 It’s made to fit small playrooms, and also connects to other “Thomas & Friends” tracks. This is a gift made to impress. With its 888 pieces, this LEGO train set takes modeling and construction to the next level. Because of its complexity and many small pieces, it’s most suitable for kids over six years old. You might need a special storage box for this one, due to the number of pieces. With so many features and accessories to play with — including a crane — your kid will have numerous opportunities for their imagination to run wild. The remote control will keep the locomotive rolling. For toddlers, a train track is sensational, but sitting on a battery-operated locomotive takes the fun to the next level. Also, if Thomas & Friends happens to be his or her favorite cartoon, this is special, guaranteed. This durable car-like locomotive is easy to operate and is accompanied by sounds and phrases. This train is suitable for the youngest of toddlers. When it becomes dull going round in circles, the locomotive also functions off the track. Watch out! If your kid’s area has limited space for a train track, this might be the solution you’re looking for. This canyon-themed train set has multi-level tracks on one side, convertible to a plain table on the other side. Because most track pieces are already assembled, little work is needed to assemble or disassemble the track. Not only could it save you space, but time as well. Showcasing a bridge, buildings, ambulance, hospital, buses, and a car, this set teaches your kids what a city entails. Traffic lights and signs will make their stories more animated and creative. The wooden train set is also compatible with other tracks. When your child grows, you won’t have any hassle adding on to it. This train set contains 75 wooden pieces, inspired by rural living. It will take your kid on adventures through mountains and by lakes, passing farms, cows, horses, pigs, and more. The design is thoughtful, and the pieces are attractive. 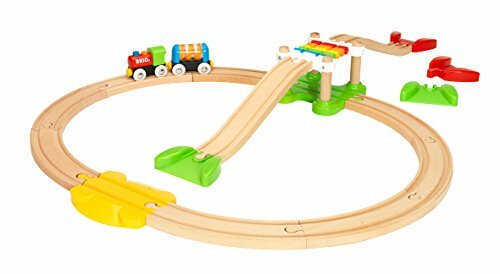 Because these wooden tracks are compatible with other brands, you’ll be able to add different tracks to expand the set and keep your child interested. This high-quality wooden train set makes for the ideal starter kit for any child aged 18 months or older. 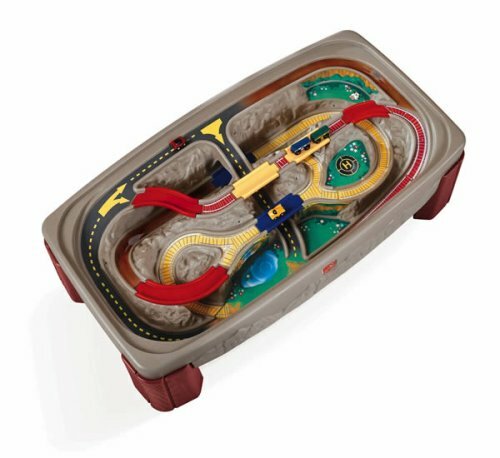 Get your little one’s creativity flowing with different track layouts, ramps, and a colorful bridge. 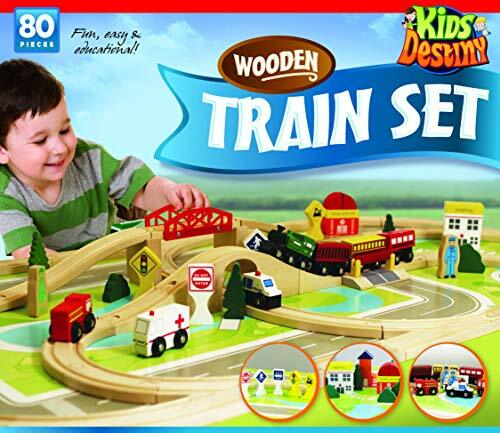 This train set is easy to assemble and dismantle, and it’s compatible with other wooden train tracks for further development. Adventure is awaiting. The Lionel Pennsylvania is the type of electric train set your kid might keep around for a lifetime. It is listed as suitable for kids 14 years or older, but younger kids can also enjoy this train set under adult supervision. The high-quality locomotive contains detailed wagons with looped fast tracks. It’s great for tech-savvy kids who like construction and model railroading. A remote controls the train’s movements, sound system, lights, and railroad announcements. 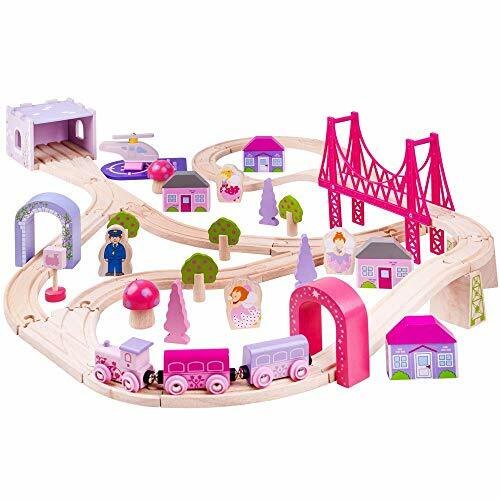 If your little girl doesn’t play with anything unless it’s pink, this princess-like train set might be a good match. Different shades of pink are included to make it stand out. The 75-piece wooden train set includes a dainty train, made to stroll through an enchanting little town. Composed of houses, fairies, and a helipad, this set is also compatible with other wooden tracks, to spread the magic. Many types of train tracks are available for kids of any age and with various interests. Whether you have a toddler or a kid approaching their “tweens,” train sets can bring with them long-lasting memories. When acquiring any new toy for my little one, I always try to combine learning and fun. For this reason, my favorite train set right now is the LEGO DUPLO number train set. I love that it teaches numbers in a simplistic but purposeful way and that its size is not too large or difficult to maneuver. I hope you’ll have as much fun with these train tracks as your kid will. Please let us know which one you chose and what your child’s response was. Leave a comment in the section below, we look forward to your feedback. And please share this article with your other mom friends!